Cy & Lyn's home....note the colors! 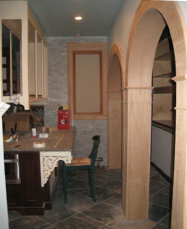 , a noted Architect in South Orange, New Jersey, contacted me about building a stained glass window for her clients Cy and Lyn. She sent a drawing of what her clients had in mind. They wanted a bright, bold window for their newly remodeled kitchen that would reflect the festive colors and spirit of their native New Orleans. 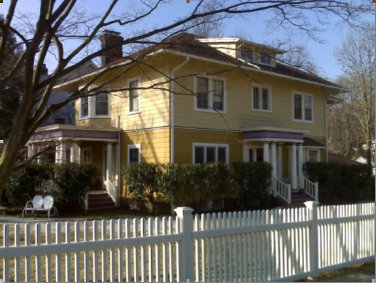 Cy and Lyn's home in Montclair, New Jersey was built in 1908 and is an interesting mix of Arts and Crafts and Colonial styling. It was built as a retirement home for an Episcopalian priest and, oddly enough, for the last 100 years, all of its owners have been Episcopalian. Cy and Lynn are completely remodeling this grand old home and wanted a window in their kitchen that would be exciting and, as they said, "not subtle". I think our finished window could certainly be called colorful! The photo to the right shows the window opening where their new window will be installed.